Google has expanded its Project Loon tests to the Nevada desert and, for the first time, into licensed radio spectrum. 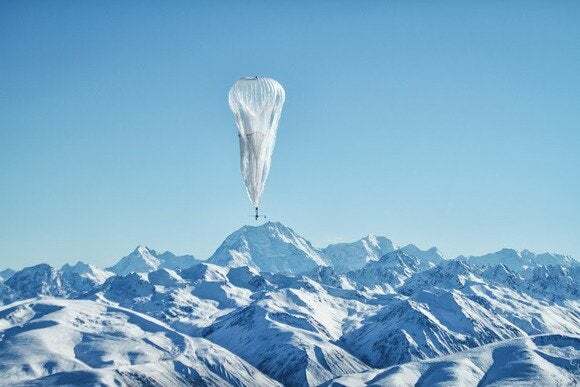 Google declined to comment on the secret trials, but a local official confirmed they are related to Project Loon, and government filings point to several recent balloon launches. Loon is an ambitious attempt by Google to bring Internet access to vast swathes of the planet that currently have little or no connectivity. The project was unveiled last June, and Google said at the time it was experimenting with balloons flying around 20 kilometers (65,000 feet) above the Earth, using radio links in an unlicensed portion of the spectrum at around 2.4GHz. But in late September, Cyrus Behroozi, the head network engineer for Loon, quietly applied to the U.S. Federal Communications Commission (FCC) for permission to test Loon across a large portion of Northern Nevada, in two chunks of radio spectrum that are used as a pair for 4G LTE services. Google’s application didn’t say exactly which wireless technology it planned to use, but it did disclose the broad type of signal: a class that includes LTE, WiMax and other point-to-point microwave data transmission systems. That clue, coupled with the use of paired spectrum, points to the likelihood of LTE. Approval from the FCC came through in November and gave Google permission to conduct six months of tests from two radio platforms: one on the ground and one up to 65,000 feet in the air, both located within 161 kilometers (100 miles) of Carlin, Nevada, a remote town of less than 3,000 people. The area covers a vast part of northern Nevada, and the license came with two conditions for Google: that it get consent from local wireless broadband operators, and that it ensure its tests didn’t take place within 25 miles of an LTE base station in Elko, Nevada, that’s operated by AT&T, Verizon and T-Mobile. Google’s decision to use licensed spectrum could be an attempt to get away from the heavy interference that can sometimes dog the 2.4GHz band, but if a commercial Loon service used the same LTE band frequencies it would complicate the rollout, because Google would need approval from regulators in numerous countries. In its application to the FCC, Google asked that details of the proposed tests be kept secret for competitive reasons. Google’s Loon balloons fly at 65,000 feet, about twice as high as commercial aircraft, so they shouldn’t pose a hazard to aviation except during their launch and descent. At those times, Google is required to warn local aviators that it will be conducting a balloon launch. So far this year, six advisories for high-altitude balloon launches have been issued in the area, according to data from Bravo Airspace, an aviation data and analytics company that keeps records of such notifications. All are very similar. The most recent was on April 7 and described the planned launch of a high-altitude balloon from the airport at Winnemucca, Nevada, close to the northwest corner of the area in which Google is conducting tests. The balloon would travel in a southeasterly direction, according to the advisory, taking it directly across the test area. A local official confirmed that Google was running Loon experiments from the Winnemucca airport, but declined to comment further, citing a confidentiality agreement between the city of Winnemucca and Google. Google did not reply to requests for comment on the Nevada tests.